"These madeleines are the real deal. This recipe gives foolproof step-by-step instructions so that you can make perfect madeleines right in your own kitchen. The sign of a good madeleine is the tell-tale 'hump' on the reverse side of each cake." Combine eggs, sugar, and honey in a large bowl. Whisk gently for 4 to 5 minutes. Avoid whisking too vigorously and do not use high speed if using an electric mixer; the end mixture should be light and frothy. Sift flour and baking powder into the egg mixture. Fold in gently until well combined. Add melted butter and salt, stirring well. Cover the bowl with plastic wrap and chill batter in the refrigerator for at least 1 hour. Preheat the oven to 460 degrees F (240 degrees C). Fill silicone madeleine molds with the batter, filling each 3/4 full. Bake in the preheated oven for 1 minute, then reduce the oven temperature to 400 degrees F (200 degrees C). Bake for 4 minutes, then reduce again to 350 degrees F (175 degrees C) for 5 minutes more. 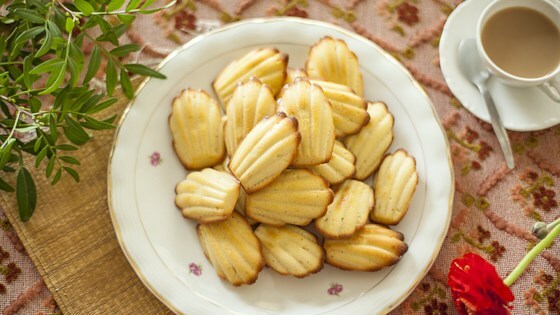 Watch how to make real French madeleines! If you don't have silicone madeleine molds, you can use metal molds instead. Be sure to butter them well and dust with flour. If your madeleine molds are very small, only bake them for 4 minutes in the last step, otherwise they will get too dark. I halved the recipe and used a metal cake pop tin. They turned out really good! I baked them for 1 minute and then, and they are perfectly cooked. I definitely recommend this recipe! A nice light, cakey cookie. I don’t have Madeleine molds so I just used an ice cream scoop and made drop cookies. Nice buttery flavor. These would probably be good with fruit.